I recently sold my trusty track-only 2005 Kawasaki ZX6R for a more upright track /street bike. I thought I would buy a new Yamaha FZ-09, but I talked with Dave Searle from Motorcycle Consumer News who told me that the FZ needed a lot of work to make it track worthy, so I opted for a slightly used 2012 Triumph Street Triple R. I rode it at a track day the day I picked it up and it performed very well in stock form. But, as a track day junkie and instructor, I needed more precise handling and I need to make sure a tipover will not keep me from continuing with my day. Besides doing the track day stuff, I also Accessorized the Street Triple with some street-oriented stuff. You might want to check that out later. Below is a video showing a couple of laps of me and the Striple at Loudon. I’m in the red vest. The Street Triple fun starts at 7:10. 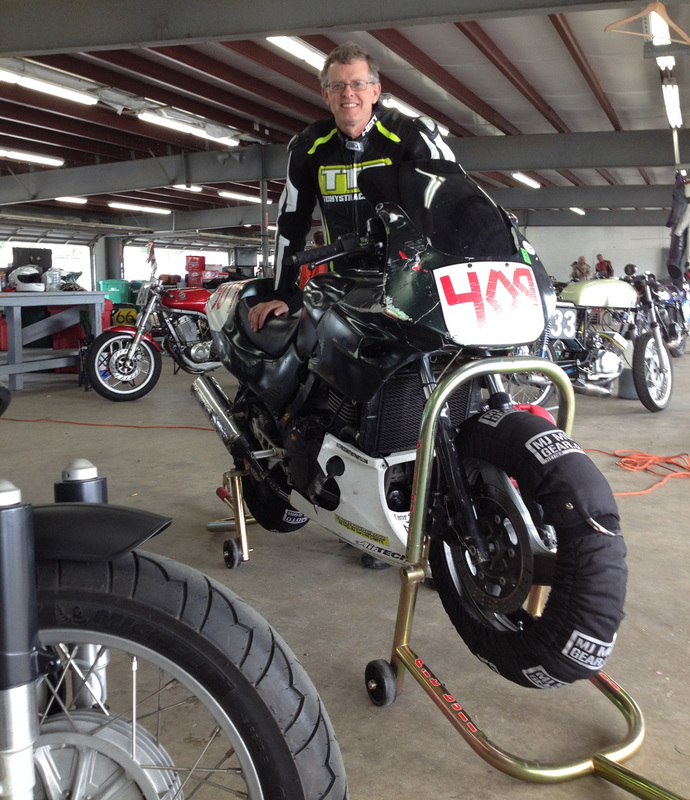 You are not required to have frame sliders or any other type of bike protection at most track day events. But, it is smart to protect your motorcycle in the event that you go down. I ride on the racetrack as one of my jobs, so I do over 2,000 track miles per season. Even though My crash rate is very low, I have been known to make a mistake or two. An investment in bike protection (as well as rider protection) can mean the difference between ending your day early or getting back out on the track to finish your day on two wheels. I also carry some spare levers and foot pegs, just in case. Here are some images of the work I’ve been doing to my 2012 Triumph Street Triple R. It is serving as my track bike and as an occasional street bike. I focused first on bolting on some engine, frame and exhaust protection. I work for Twisted Throttle, so it made the most sense that I use products that they import and sell. The stuff from R&G Racing and SW-MOTECH are top shelf, IMO and I would consider using their products even if I didn’t get the employee discount. Click the links to see all of the Twisted Throttle products for the 2012 Street Triple and 2008-2011 Street Triple. Wired oil filler and dipstick caps: I leave more wire at the ends so I can simply unwind the tail end, pull it through the hole and then reuse the wire after an oil change. R&G Racing swingarm spool and protector, in combination with the Woodcraft spool and protector: I have both of these swingarm protectors because I have seen too many swingarms get damaged when the threaded swingarm spools break off in a crash. I decided to add the axle spools/protectors to try and give a second point of contact to hopefully prevent the threaded boss in the swingarm from getting damaged. Another reason to have both spools s because you can’t use the rearward R&G spools to support your bike with a race stand for removing the wheel, because they must be removed to take out the axle. So you need the other spools as well. Peter Kates from Computrack Boston works his magic. The suspension was upgraded over the winter to include Penske fork valving, a .95 fork spring swap and a Penske 8983 with a remote reservoir. The stock suspension is very good, but at the level I need to ride when instructing for Tony’s Track Days, I need a bit more adjustability than the stockers can provide. The remote reservoir was a bit difficult to locate, making the extra cost of a piggyback worth considering. But, it works great. The highly regarded skills of Peter Kates from Computrack Boston were employed. PK has been around the Loudon paddock for years and is the go-to guy for suspension and chassis tweaks.After some compression and rebound damping tweaks and a change to a 750 pound spring, the shock is now setup for serious lap times. What is interesting is that the suspension now doesn’t work as well at slower speeds. It’s a bit busy UNTIL you turn up the speed and then it all makes sense (like most race setup suspension). Forks recessed into the clamps adds sorely needed trail. And the Scott’s damper is a nice thing to have for cresting hills at speed. One other thing I had Peter do was measure the chassis to get the rake and trail to be set at the optimum numbers for fast riding. This means increasing trail on the Triumph 675s. Many Daytona riders opt to replace their triple trees with one with less offset. this gives them the trail needed for mid-corner stability and cornering feedback. The Street Triple is closer than the Daytona in regards to trail, so instead of springing for the $800.00 triples, Peter slid the fork tubes down inside the top clams as far as possible. It looks weird, but it did increase mid-corner feel at speed without slowing turn-in. 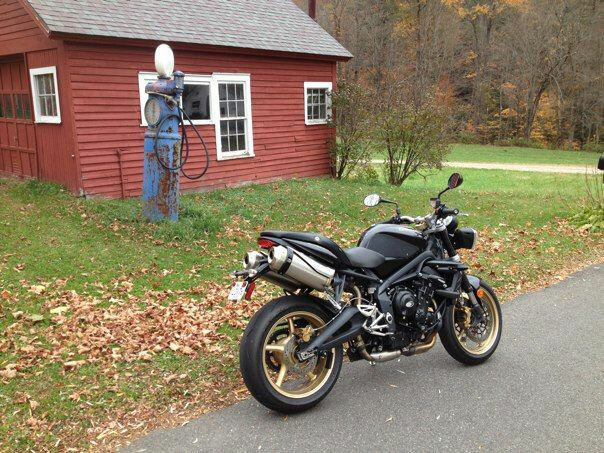 Pirelli Supercorsa on 2012 Triumph Street Triple R after 2 sessions at NHMS (Loudon) running in the advanced group. People have a lot of questions about tires. I have done track day laps on all kinds of tires, including basic OEM rubber, Sport touring tires, sporty street tires, and DOT race tires. Believe it or not, most all are capable of keeping you on two wheels when ridden at a novice, intermediate, or a slower advanced group pace. I have used Michelin Power One race tires for the last few track day seasons and loved them, but this year I am switching to Pirellis. The reason is that I always liked the feel of Pirelli tires and it doesn’t hurt that TTD is supported by Motorcycle Tires and Gear (MTAG), who also supplies Pirelli tires to the Loudon Roadracing Series. My Street Triple comes stock with Pirelli Rosso Corsa, which is a proven track day favorite with many of the TTD staff, including my daughter, Jeannine. I rode the first 3 session at Loudon on the Rossos and had no sense that the tires were limiting me in any way. I changed over to Pirelli Supercorsa race tires after lunch so I could compare the differences and so would have fresh rubber for the track day that Tony and I will be attending at Barber Motorsports Park in November. I got along with the Supercorsas just fine, thank you. I immediately braked deeper, accelerated stronger and cornered harder to a point where I approached my best times I typically do on my ZX6R. I was impressed. 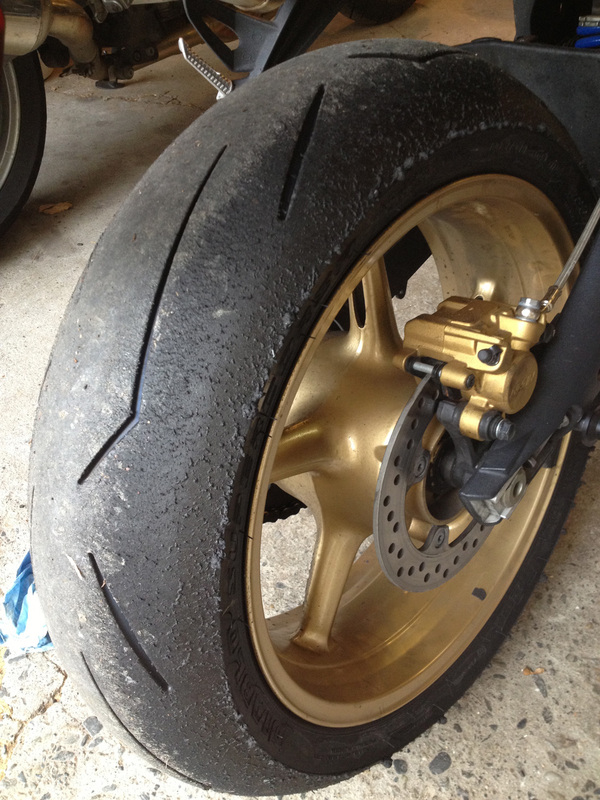 Does the average track day rider need race tires? No. Most modern sport-oriented tires that are relatively new will do just fine. It comes down to whether your level of riding is good enough for you to actually use race ribber. Most people have a long way to go before the answer to this question is yes. Run what ya brung, mister. The stock Street Triple rearsets are very comfortable for street riding, but are too far forward and are a little too low for aggressive track riding. I dragged my toe slider before I was dragging my knee, which is no good, as I use my knee dragging to measure my lean angle. And without that tool, I am not able to monitor lean angle with the same level of confidence I like. The stock footpegs are also too far forward for moving from side to side without pulling on the handlebars. Footpegs that are further rearward allows me to use my legs to support my torso when flopping from left to right, especially when doing so uphill, like what happens at turn 7 and turn 8 at NHMS. The 2007 Daytona rearsets bolt on easily with no issues whatsoever. I could even use the stock shift rod. The rear brake light switch needs a bit of adjustment, but that’s really easy to do.The Daytona pegs could be even further back for my taste, but it’s a big improvement at 1″ further back and 1/2″ higher compared to the stocker STR rearsets. I also think the Daytona rearsets look great. I installed some shorty levers, which are more adjustable than the stock ones and are less likely to break in a crash. The short levers also accommodate two finger use and they look cool. I’ve used ASV levers before and really like them, but a lot of racers use the cheap knock-offs from China, so I’m giving them a try. I installed the levers and they seem fine. Perhaps they aren’t as nice as the expensive ones. but they are good looking and work great. I have to get used to the shorties after always having standard long versions. Like a lot of sport bikes these days, the tank on the Street Triple sticks out on either side, enough to cause serious damage in a crash. The latest R6 tanks are known to puncture where the tank sticks out. I opted to mount the R&G Racing tank sliders on the Triple. They are glued on using Aquarium sealant. I asked R&G whether this sealant will harm paint and they say that it will not. They look a little to Squidly for my tastes, but they will do the job if I were to crash. I just installed a Tiger 1050 throttle tube, which has a larger diameter cylinder that the cables run on. This means that the distance (and time) it takes to reach full throttle is reduced. Racers install quick throttle tubes as a matter of course so they can get to full throttle in an instant. 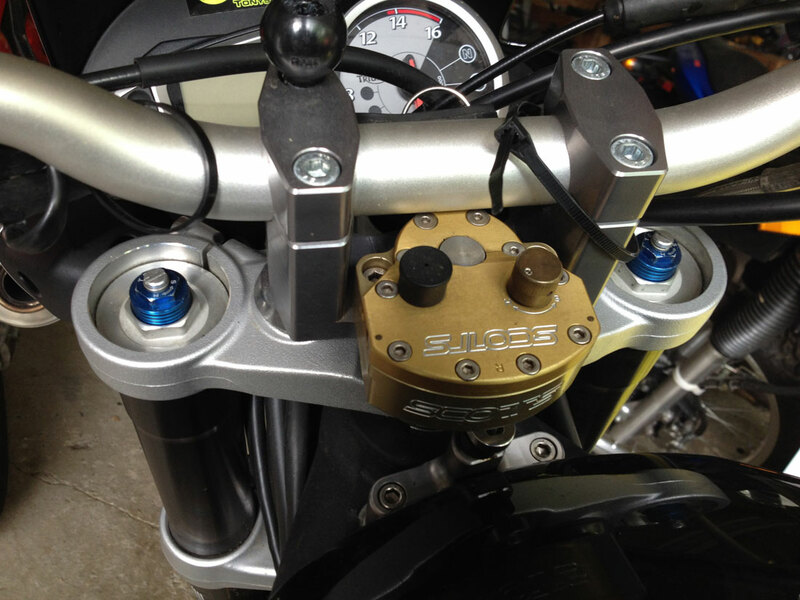 Motion Pro makes a throttle kit that includes several cams to suit the rider’s preference. The 1050 tube is cheap and is a stock item that is an intermediate upgrade without going the full race route. The installation of the throttle tube was easy. However, I read about the throttle housing c=screws being easy to strip, so I grabbed my impact driver and with a few whacks, loosened the screws. Another slight complication was that the throttle wouldn’t snap back with the larger diameter throttle tube. After some investigation, I discovered that the throttle cables needed more slack… piece of cake, since the “pull” adjuster was about 6 inches down the cable from the throttle grip. Now it’s perfect. This is where the gear shift sensor is located. The wire goes to the unit that is behind the plastic countershaft sprocket cover. The old gear shift sensor. It seems that the Triumph 675s are notorious for having bad gear position sensors. The symptoms are a Check Engine Light (CEL) and any manner of numbers appearing in the gear indicator area of the speedo/tach instrument cluster. I bought the Tuneboy ECU reader and after many attempts to get the software to work (thanks Paul) I managed to confirm that the CEL was the result of the gear shift sensor going bad. Some people have had good luck cleaning the old one, which worked for a while on my bike. But, in the end, the CEL kept coming on. What’s the big deal? you ask. Well, the bike ran fine, but the Tuneboy data shows that different fuel mapping occurs with the different gears. That means without an accurate indication of which gear you are in, the ECU can’t trigger the correct map. The sensor is located behind the plastic countershaft sprocket cover with the connecting wire underneath the tank. You have to remove the gear shift rod. Hint: The small c-clips that hold the shaft onto the pivot balls poke into a small hole on the side of the shaft’s ball ends. Prop up the tank using the rod that is stored under the seat to get to the wires. The newer version kit has a 8 inch jumper harness that plugs two of its leads into the Throttle Position Sensor located on the right side of the injector bodies. The new “kit” that was indicated for my bike included the sensor with a wire plug that does not fit the old plug from the bike’s harness. The kit includes a 8 inch jumper harness that plugs into the old harness, the new sensor at one end and the other ends plug into the Throttle Position Sensor located on the right side of the throttle bodies. The wire is long enough to cross underneath the fuel tank. Some say it may provide a power boost. We’ll see. At least the ECU will know what gear the bike is in. After changing the sensor, the CEL went out after three startups. I am taking the bike to the track again in a week and I’ll see if any power advantages occur because of the new harness and sensor. Stay tuned. Oil filter and drain plug wired to keep fluids where they belong. below for requirements). Many people don’t have access to a truck or trailer and ride to the track on their street bikes. They remove their mirrors and licnse plate (if necessary), disconnect or cover the brake lights, lower their tire pressures (30,f, 30 r is a good starting place) and they are ready to go through tech inspection. Staffers are there to help with any issues. Motorcycle prep should not be a reason for not attending a track day! One thing that seems to stump a lot of riders is how to secure a spin on oil filter. It’s as simple as getting a 4″ hose clamp from your auto parts or hardware store, slip it around the filter and rotate it so it hits a solid part of the engine or frame to prevent the filter from spinning off. If necessary, wire the clamp to a solid object (see photo). Sometimes, video is worth a thousand words, so here I present three videos from the recent trip down to Barber Motorsports Park in Alabama. Below is a video that Aaron (Aprilia RSV4) shot of my first few warm up laps during that last session. The video does not show just how much of a roller coaster this track is. The elevation changes are significant. The Museum turn where we ride over the curbing is a less extreme version of the corkscrew at Laguna Seca. Here’s one where I follow Tony onto the track and then he takes off. Tony got a hang of the track pretty quickly. It was about 45 degrees but sunny, so after a few slow laps, the tires were able to get warm enough for us to lay down some fairly quick laps. I was still learning the track and I can see several areas where I could maintain higher entry speeds and get on the gas earlier. Can you spot these places? Below is a video posted by Keith (Ducati 1100 EVO Monster). I appear after 4 laps or so. Thanks Keith! Barber motorsports part X-Act Nov 24 from GYRO BOX on Vimeo. My trusty and familiar ZX6R. Monticello, NY. 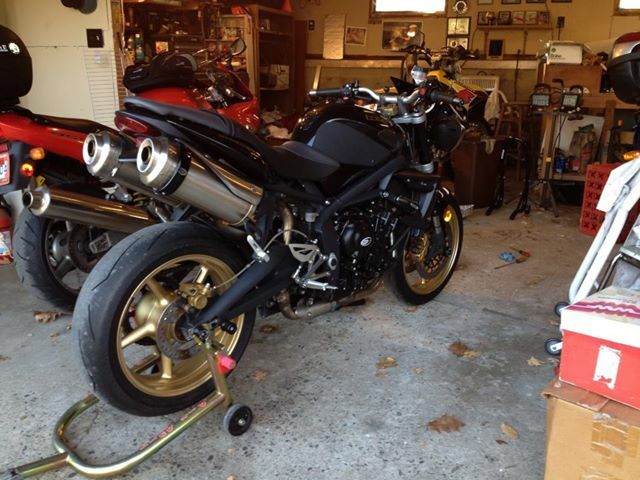 I recently sold my trusty ZX6R for a more upright Triumph Street Triple R as my track day bike. I needed the more upright position as a way to help a chronic neck problem. The Street triple allows me to sit up when I’m working with track day customers at a slower pace. But, the upright and exposed ergonomics means I have to hunker down to get out of the wind blast when I’m going flat out. I’ve ridden all types of bikes on various racetracks and usually acclimate myself pretty quickly to them. While some adjustment was not entirely unexpected, it did take a couple of sessions for me to start to get along with the ST-R. 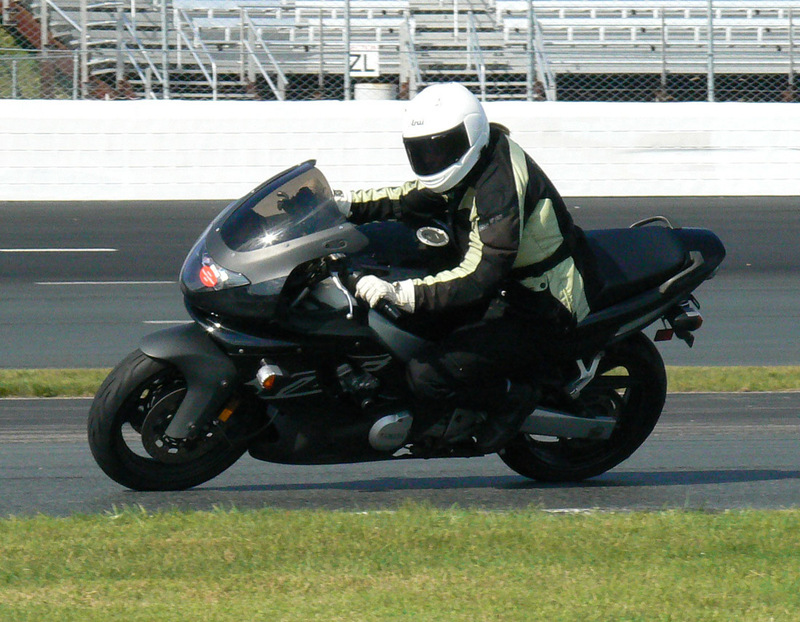 The first track session on the Triumph was my first time riding the bike (I picked it up on my way to the track). The track was cold and a bit damp, so I took it easy. I came in at the end of that session not knowing whether or not I made a mistake buying the Triple. The night before, fellow TTD instructor, Joel Allen helped me adjust the suspension to accommodate the bumpy Loudon circuit and then Peter Kates from Computrack Boston rechecked Joel’s work (spot on) the next day. Thankfully, I knew that suspension that is set up for going fast simply does not feel right when you’re not going fast. Riding at 60% made the bike seem like it wouldn’t hold a line. I kept hope and went out for another session. The track was warmer and so I got up to speed. Ah, that’s better. A smile was on my face at the end of that faster session. 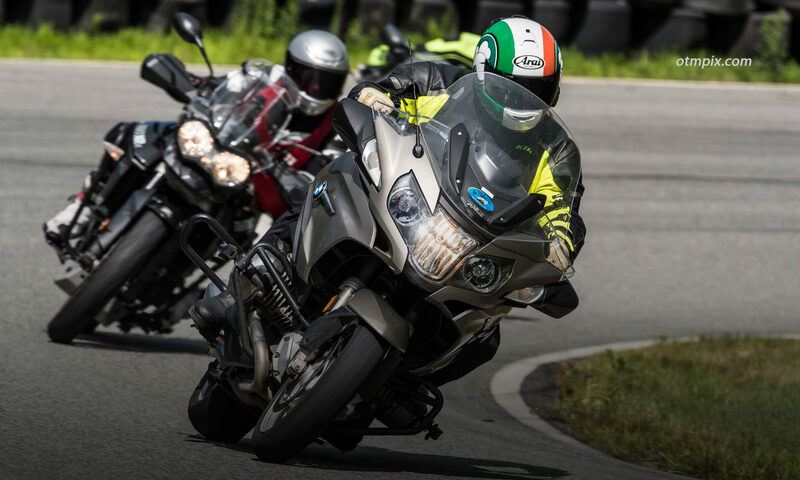 The increased pace helped make the handling make sense, I then had to adjust to the upright riding position, which is not nearly as intuitive as a sportbike posture when riding fast. Sitting on top of a bike instead of low behind a fairing makes 120 mph a tiring experience. Transitioning my body from left to right at turn 7 and 8 at Loudon required me to use too much handlebar support while accelerating up the hill. More rearward footpegs would be needed (I traded the stock rearsets for Daytona rearsets, which should help). Midway into the second track day of the 2-day event, I mounted Pirelli Diablo Supercorsa race tires so I could see what the bike was capable of. I was pleasantly surprised how well I got along with the Striple, with my lap times edging very close to my typical times on the ZX6R. Next stop, Barber Motorsports Park in Alabama in a couple of weeks. I can’t wait. Read all bout the track day preparation I have done to the Street triple R.
The lucky new owner of the ZX6R. I hope you enjoy it as much as I have. Yesterday was a sad day. 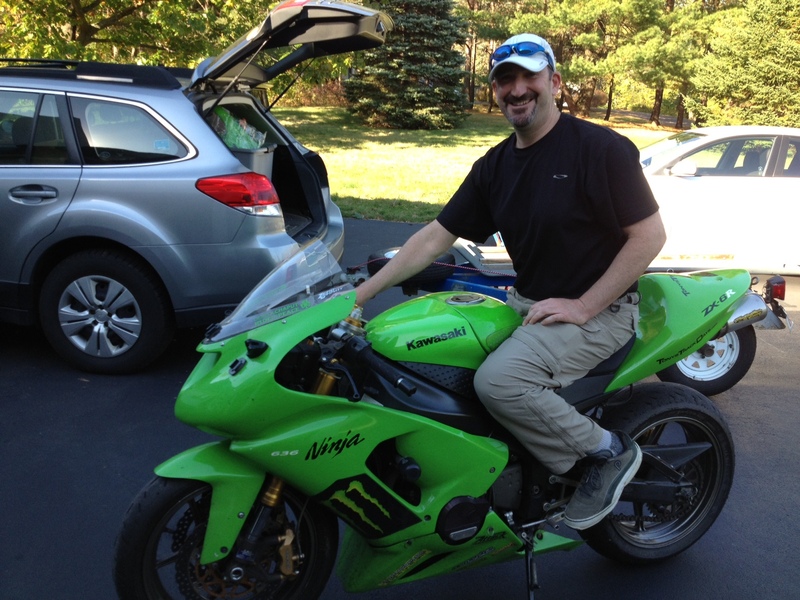 I delivered my 2005 Kawasaki ZX6R track bike to its new owner. The transaction went really smoothly; the new owner is a track day friend who I like and who I know will take good care of the ZX, and I got the price I needed for the bike and all the spares. So why is it so difficult to part with this conglomeration of aluminum, steel, rubber and plastic? I know I’m not alone. Many people I talk with have the same experience as I when it comes to saying goodbye to a motorcycle they’ve owned for a period of time. I’ve been sad every time I watched the taillight of all my previous bikes roll away in the back of some stranger’s truck or trailer. The Honda CB900F, the RD400 race bike, the Ninja 750, the VFR800, the MZ Scorpion racer, and now the ZX6R. Motorcycling is more than transportation. When we ride, we become immersed in an experience and the motorcycle plays an intimate part in that experience. I equate it to having a dance partner whose subtle moves become familiar over time. Bikes are riding “partners”. You can become more or less involved and attached with a particular bike depending on the experiences you had “together”. For instance, the motorcycles I have had the most epic experiences on tend to find their way deeply into my heart. Motorcycles become part of a rider’s identity. Deciding to sell a bike that you were proud to own can require you to rethink your identity and sense of individuality. The act of letting one bike go to make room for a new motorcycle requires a certain amount of personal reflection as we transition our identity to the new machine. We invest in our motorcycles, both emotionally and financially. Many of us care for our motorcycles as if they were a human, putting the “good” oil in her, lubing all the necessary parts, and keeping her clean. We spend money on personalizing our machines so they fit our identity and needs. Whether this is crash protection, chrome or carbon fiber bits, or luggage or navigational farkles that we bought with the idea of finally conquering those epic adventures. Tell me about your experiences with selling bikes. What bikes were the hardest for you to let go and why? I’ve sold three race/track bikes. The thing about parting with a bike that you’ve relied on to not only perform well enough to allow you to beat the competition, but also to be solid enough to keep you safe when flirting with the hairy edge of control can be extra difficult. Race bikes require an extra level of personalization so that the suspension, controls, and engine/fueling performance is suited to your individual preferences. A lot of time and money is spent getting a motorcycle right so it can perform on a racetrack at an expert level. That said, many racers look at their race bikes as journeyman tools that have one purpose; to get the job done. Once it becomes uncompetitive, it is cast aside for a sharper instrument. I don’t mean to sound cold, but the mindset of a serious racer is different than a street rider who takes pride in being a motorcyclist and chooses a particular bike not only for how it performs, but also for the pride the bike gives its owner. 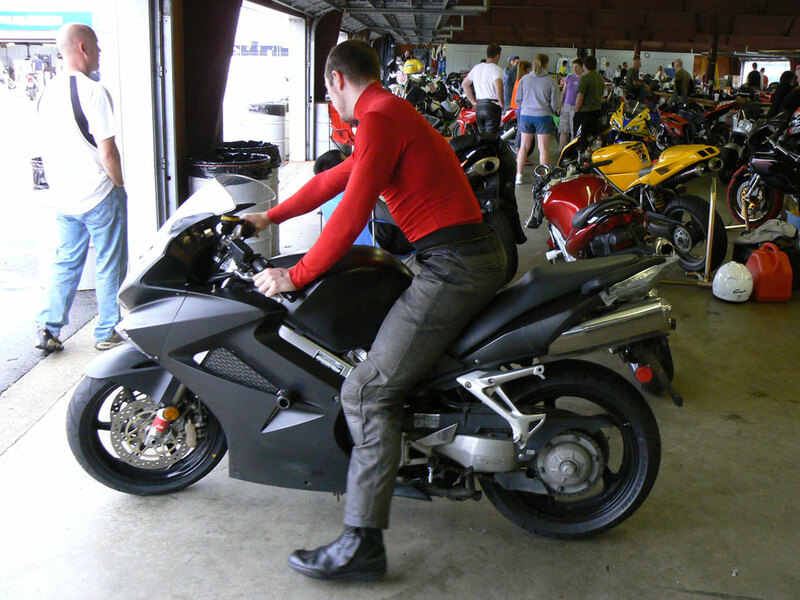 My ZX6 was unique in that it was a track weapon, but not to win trophies, rather to do my job as a track day instructor, and to provide me with fun when I got to run hot laps on my own. As such, I have shared countless miles with it revving over 12k rpm and at sometimes crazy lean angles. It was a companion that made me feel (and look) good. I will miss it dearly.